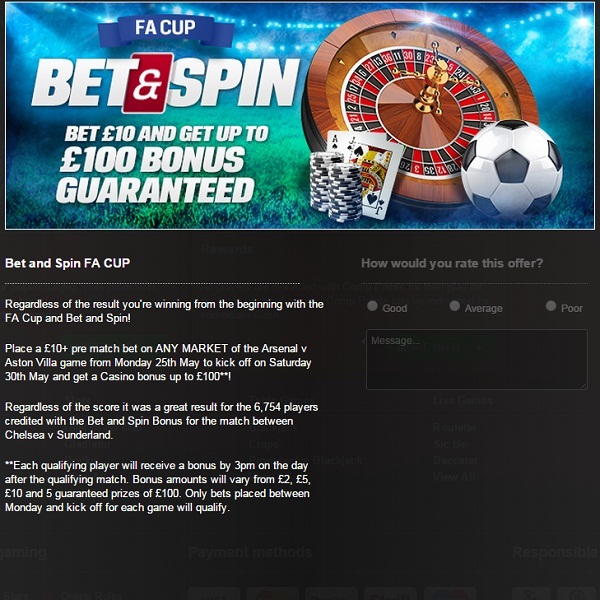 Football fans are in for a treat this weekend at Coral Casino thanks to the FA Cup Bet & Spin promotion which is offering some huge bonuses. All members have to do is place a £10+ pre match bet on any market of the Arsenal vs Aston Villa final and they will be eligible for a bonus worth up to £100. There are loads of betting markets available on the final such as outright result, correct score, goal scorers, both teams to score and many more. Coral Casino ran the same promotion on the last FA Cup game and 6,754 players received bonuses of between £2 and £100. This weekend everyone who qualifies for a bonus will receive it by 3pm on the day after the match and the bonus will be worth either £2, £5, £10 or one of 5 guaranteed prizes of £100.